The quantity and influence of generalisable data presents challenges and opportunities for public policy making. Helen Margetts discusses how social scientists can help policy-makers in this changed environment, ensuring that social science research remains relevant, and warns that social science concerns or questions may be increasingly ignored if ‘big data’ education and training is left completely in the hands of computer scientists. As I discussed in a previous post on the promises and threats of big data for public policy-making, public policy making has entered a period of dramatic change. Widespread use of digital technologies, the Internet and social media means citizens and governments leave digital traces that can be harvested to generate big data. This increasingly rich data environment poses both promises and threats to policy-makers. So how can social scientists help policy-makers in this changed environment, ensuring that social science research remains relevant? Social scientists have a good record on having policy influence, indeed in the UK better than other academic fields, including medicine, as recent research from the LSE Public Policy group has shown. Big data hold major promise for social science, which should enable us to further extend our record in policy research. We have access to a cornucopia of data of a kind which is more like that traditionally associated with so-called ‘hard’ science. Rather than being dependent on surveys, the traditional data staple of empirical social science, social media such as Wikipedia, Twitter, Facebook, and Google Search present us with the opportunity to scrape, generate, analyse and archive comparative data of unprecedented quantity. For example, at the OII over the last four years we have been generating a dataset of all petition signing in the UK and US, which contains the joining rate (updated every hour) for the 30,000 petitions created in the last three years. As a political scientist, I am very excited by this kind of data (up to now, we have had big data like this only for voting, and that only at election time), which will allow us to create a complete ecology of petition signing, one of the more popular acts of political participation in the UK. 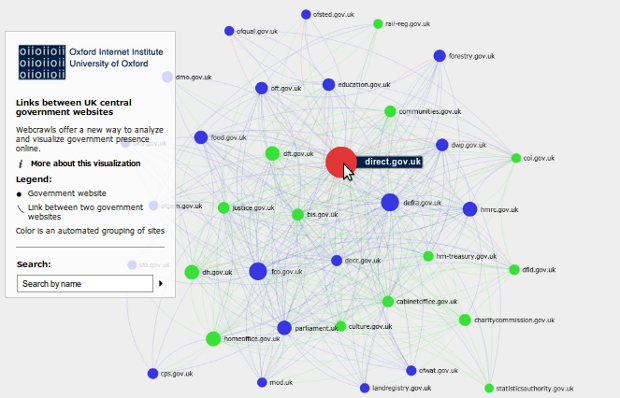 Likewise, we can look at the entire transaction history of online organizations like Wikipedia, or map the link structure of government’s online presence. But big data holds threats for social scientists too. The technological challenge is ever present. To generate their own big data, researchers and students must learn to code, and for some that is an alien skill. At the OII we run a course on Digital Social Research that all our postgraduate students can take; but not all social science departments could either provide such a course, or persuade their postgraduate students that they needed it. Ours, who study the social science of the Internet, are obviously predisposed to do so. And big data analysis requires multi-disciplinary expertise. Our research team working on petitions data includes a computer scientist (Scott Hale), a physicist (Taha Yasseri) and a political scientist (myself). I can’t imagine doing this sort of research without such technical expertise, and as a multi-disciplinary department we are (reasonably) free to recruit these type of research faculty. But not all social science departments can promise a research career for computer scientists, or physicists, or any of the other disciplinary specialists that might be needed to tackle big data problems. This post is based on discussions at the workshop on Responsible Research Agendas for Public Policy in the era of Big Data workshop and the Political Studies Association Why Universities Matter: How Academic Social Science Contributes to Public Policy Impact, held at the LSE on 26 September 2013. This post originally appeared on Oxford Internet Institute’s Policy and Internet Blog (@policyinternet) and is reposted with permission. Helen Margetts is the Director of the OII, and Professor of Society and the Internet. She is a political scientist specialising in e-government and digital era governance and politics, investigating the nature and implications of relationships between governments, citizens and the Internet and related digital technologies in the UK and internationally. She can be found on Twitter @HelenMargetts.